I hope you had a great weekend! I have been doing a bit of binge watching tv on days that I am “down for the count’. and am enjoying ‘Stranger Things”, “Ray Donovan” although it hasn’t been the best season, and “Mindhunter’ a great new character-driven show about the people who began the process of interviewing criminals in order to develop the psychological profile for the FBI’s BAU. Now, however is the time of year where I begin the hunt for Christmas presents. Seems I am slowing a bit down as I used to have most of my shopping done in Oct! Today I am sharing with you my favorite of the knee high Jambu boots, these luscious premium leather boots., the CHAI. There will also be an INSTAGRAM US. GIVEAWAY BEGINNING later today to win a pair of Jambu shoes. Also remember as a readers of EDS, you can use the CODE STYLISH17 for 20% off with your purchase. So, if you want a chance to win,and you live in the States, you have to first follow me on my Instagram account. As you have seen through prior posts on JAMBU, they offer Italian leather crafting and memory foam in their shoes, making them the most comfortable shoes i own! This color was so rich and beautiful, I could see it paired with much of my warm toned winter clothes. It does come in black and whiskey, the color I am wearing here. 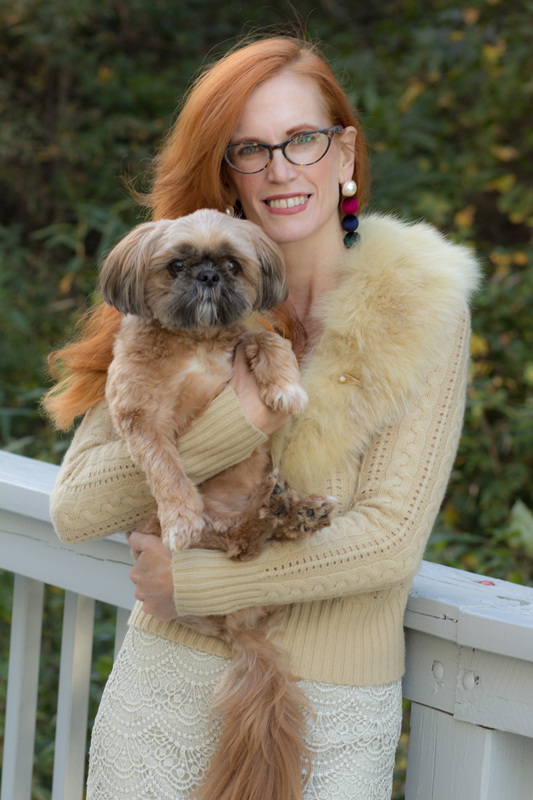 I saw this glamorous faux fur sweater from Anthropologie on poshmark, and had been looking for a replacement for one of my worn Loft sweaters. I decided to pair it with one of my favorite skirts from Ann Taylor, adding color with my velvet earrings, Louis Vuitton Damier bag and these rich-toned CHAI boots from Jambu. So if you are looking for some comfortable boots for women, these are another choice from Jambu. 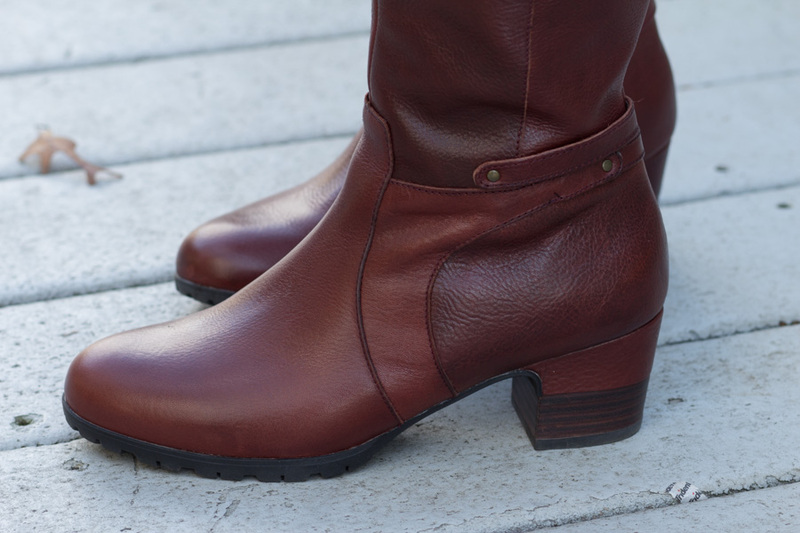 I have been a bit boot crazy this Fall ( isn’t that one of the best part of Fall Fashion) and want to express how comfortable Jambu’s boots are! Also, you can read my other 3 posts on the other boots/shoes I reviewed. They are all beautiful choices. 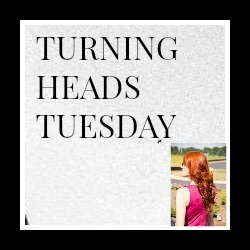 Just know, if you are not a blogger, and want to know more about Turning Heads Tuesday, read HERE. Click on any of the thumbnails below to read about fall fashion/beauty from bloggers who post. It’s alot of fun! 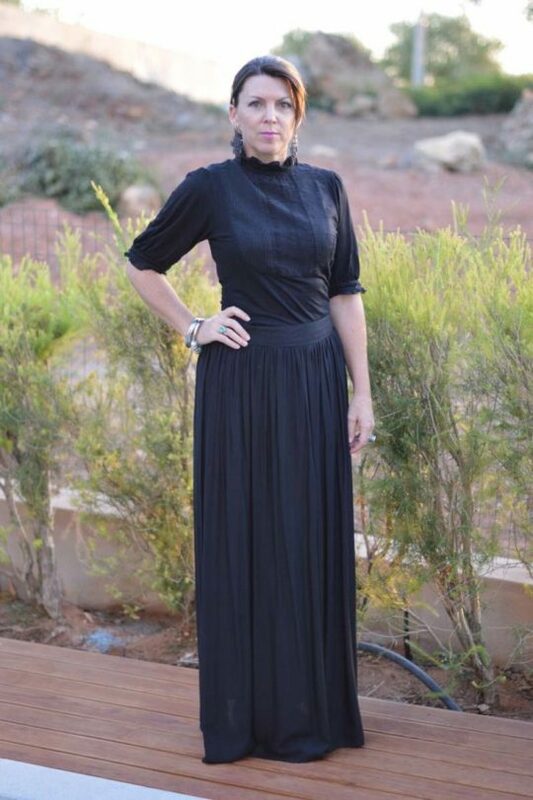 Most clicked: Suzy of Suzy Turner Blog with a Victorian Halloween look. 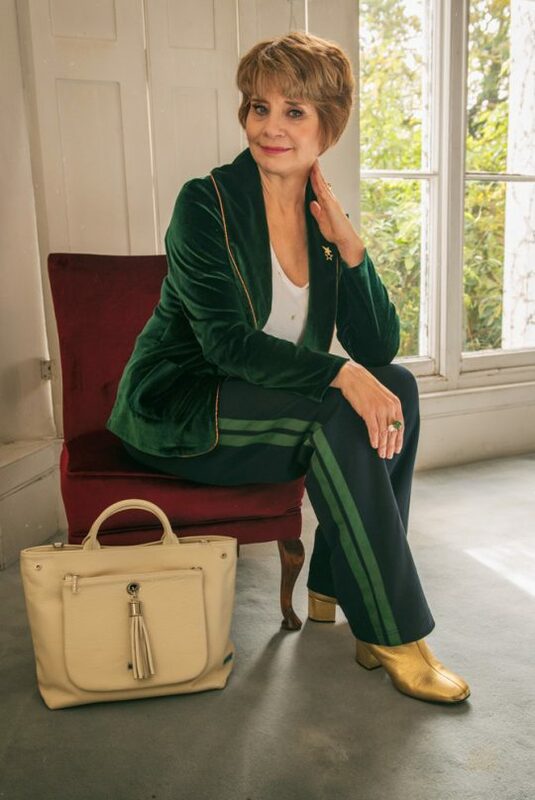 Pinterest Pic of the Week: Gail from Is this Mutton in a stunning emerald green velvet look. Loving those boots and they look so nice with the skirt. Thanks for sharing on the link up over at A Pocketful of Polka Dots’ Fabulous Friday. Thank you for joining the Top of the World Style linkup party. The lace with the cozy sweater are unexpected together, but look great together. I love those boots. Riding boots are one of my favorite things to wear this time of year. I also love your gorgeous sweater and cute doggy! 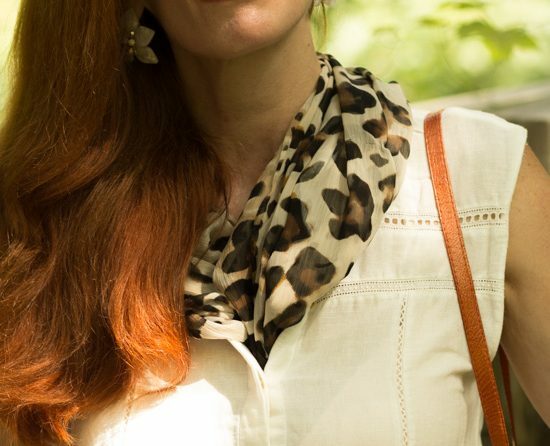 Jess, I love this combo of colors and textures. You look gorgeous as always. Those boots look comfy and I love the color. Beautiful look. I love the faux fur and lace mix! These boots are so fabulous and are such a great color – even better they are so comfy. Darling earrings, too! Boots are such a fall must! These look very similar to my Frye boots and I love that you mixed with a lacy like skirt. Thanks for linking with The Blended Blog Jess! Beautiful skirt and sweater and I love the boots! They look so comfy and very versatile! 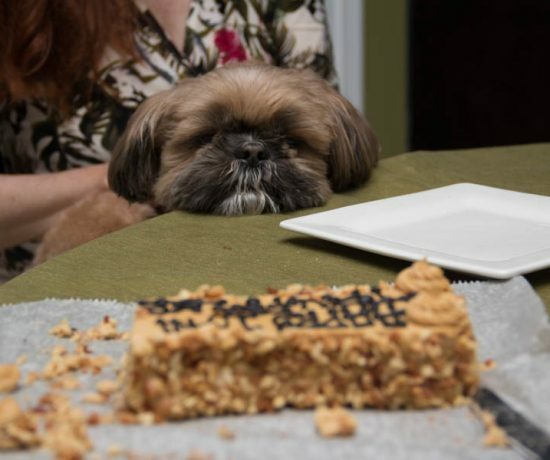 Your puppy is so cute! Such beautiful boots, Jess! I love the color and the style! They look amazing with the light colored outfit! Thanks for the link up & I hope you’ll have a great rest of the week! Those boots are beautiful! I love the deep red color! Beautiful outfit Jess! I love your sweater and your lace skirt and those boots are amazing. The LV bag was a perfect addition! I have not shopped yet for Christmas presents. I guess with all that is going on I kinda of have not had time. Gorgeous boots! I love the skirt! I’m totally boot crazy, too! These boots look so comfortable and luxe! I’m also crushing on your cardigan! Beautiful boots! I love the colour and the heel height is just right. The mix of faux fur and lace is gorgeous! Thanks for hosting and linking up! Love this outfit ! The first sweater is stunning and the boots are so chic, bonus that they are waterproof! Great boots but I love your cardigan with the fur and how you combined it with the lace skirt. Fab combo! These boots are so killer, lady- classics! I love everything about this look! Especially, a combination of fur and lace. Great pair of boots, so perfect for fall. Loving your furry cardi!! Thank you for hosting Jess. You always put together the best combinations, Jess!! And these boots are quite impressive!! Jess, this is a fantastic look and those boots are fabulous. I adore the blended of soft and rough elements like lace and leather. Thank you for sharing your styling ideas and for hosting. I love the color of those boots! And I am loving that skirt, it’s gorgeous! Beautiful Jess! I love that sweater and those boots! Gorgeous skirt too! Jess, those boots are so pretty and lush! I love the rich color and they look so great with the neutral colors of your outfit. They look like great boots! Thanks for the link up, Jess! Wow wow wow, I just had to pin you! What a wonderfull outfit! And the doggie blends in perfectly LOL. Those boots look fantastic. Love the boots and the faux fur sweater! Your outfit is wonderful , the colours and mixed textures are so perfect together and those boots add to the mix. I love the shot of you and your fur baby- how clever to colour co-ordinate.Thank you for hosting, Jess. The color of these boots is gorgeous! They look so comfy, too. Hope you’re having a great week and thanks for hosting the link-up!